The last thing fourth-grader Jake Henry remembers (before the world as he knew it disappeared) is napping at summer camp. 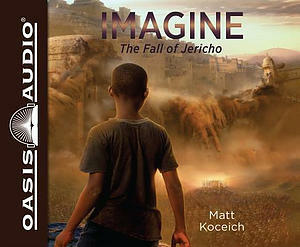 What happens next can't be explained as Jake finds himself surrounded by massive stone walls that rise up all around him--in ancient Jericho Imagine. . .The Fall of Jericho is the third release in an exciting epic adventure series for kids ages 8 to 12 written by schoolteacher Matt Koceich. The Imagine series brings the Bible to life for today's kids as they ponder what it would be like to live through a monumental biblical event. Imagine. . . the Fall of Jericho by Koceich, Matt was published by Oasis Audio in October 2018. The ISBN for Imagine. . . the Fall of Jericho is 9781640910812. Be the first to review Imagine. . . the Fall of Jericho! Got a question? No problem! Just click here to ask us about Imagine. . . the Fall of Jericho.